Tips: If you are travelling in group of 4 to 7 people, taking taxi / airport van transfer from Incheon Airport can be as cheap as taking bus! You will also arrive at the door step of your hotel / destination in Seoul. Where to Take Bus 6001 at Incheon Airport to get to Myeongdong? There are two places where you can board shuttle Bus 6001 at Incheon Airport Terminal 1 to get to Myeongdong (NOTE: Bus 6001 also picks up passengers at the new Terminal 2). The first boarding point or bus stop at Incheon International Airport is at the Arrival Terminal Building 1st Floor, Bus Stop 6A or Bus Stop 12B or the new Terminal 2 (T2) 1 basement floor Number 29. The location map of the 6001 limousine bus stops at Incheon Airport Terminal 1 is shown below. Floor Plan of Incheon Airport T1 showing the location of Bus Stop 6A and 12B where you can board bus 6001 to Myeongdong. Bus 6001 will arrive at Myeongdong Station in approximately 1 hour of shuttle bus journey after departed from Incheon Airport. The 6001 bus stop at Myeongdong Station is located between EXIT 3 and EXIT 4 of Myeongdong Subway Station. The bus ticket for bus 6001 from Incheon International Airport to Myeongdong costs KRW15,000 person. This is the same price compared to bus 6015 which also goes from Incheon Airport to Myeongdong. Other than Myeongdong Station, Bus 6001 also can bring you to other destinations in Seoul, including Hankang Bridge Northern Most Section, Namdaemun Market (Bank of Korea) and Toegye-ro 3 Hanok Village (Mark Hotel T). Additionally, bus 6001 can also bring you from Incheon Airport to Subway Stations such as Sinyongsan Station, Samgakji Station, Sookmyeong Women's University Station, Seoul Station, Myeongdong Station and Chungmuro Station (Hotel PJ). The following hotels are also one of the bus stops for bus 6001 from Incheon Airport: Four Points by Sheraton Hotel (galwoldong), Ibis Ambatel (Myeongdong), Seoul Royal Hotel (Uljiro), Best Western Gookdo Hotel (Uljiro 4-ga), Hotel Acacia (Western CO-OP Residence), Eastgate Tower Hotel (Uljiro Co-Op Residence), Toyoko-Inn Hotel or Toegye-ro 6 (Skypark Hotel Dongdaemun). To get to these bus stops, you can also take limousine shuttle bus 6001 from Incheon Airport which only costs 15,000Won. Limousine Bus 6001 departs from Incheon Airport to Myeongdong every 20-30 minutes. The first bus from Incheon International Airport to Myeongdong departs from the airport at 5.50am in the morning. On the other hand, the last bus will depart Incheon Airport at 10.40pm in the evening. Notice that there is no late nite bus for bus 6001 to Myeongdong. Therefore, if you flight arrive at Incheon Airport later than the last bus, you will need to export other options such as AREX train followed by Subway Train or take the taxi. Alternatively, you can also stay over night at Incheon Airport to catch the first shuttle bus to Myeongdong on the next day which departs at 5.50am. In order to take bus 6001 from Myeongdong Station to Incheon Airport, you need to board the bus from the Bus Stop across the road (opposite the arrival station). The bus fare is the same, which is KRW15,000. The limousine bus will take approximately 1 hour from Myeongdong to Incheon Airport. Be sure to catch an earlier shuttle bus to Incheon Airport to make sure that you have sufficient time to clear immigration and board the flight. You can also do your last round of shopping at Incheon Airport or claim your tax refund if you go to Incheon Airport earlier. Should I take Bus 6001 or 6015 from Incheon Airport to Myeongdong, Seoul? Actually, both bus 6001 and bus 6015 will take you from Incheon Airport to Myeongdong Station in Myeongdong (although the arrival station is opposite of each other on different site of the road). Even though bus 6001 ticket fare is the same compared to bus 6015 (KRW10,000), bus 6001 is slightly faster than bus 6015. Bus 6015 will take approximately 70-75 minutes to get from Incheon Airport to Myeongdong because Myeongdong Station is the last bus stop on its route. On the other hand, shuttle bus 6001 only takes 63-68 minutes from Incheon Airport to Myeongdong. This is because Myeongdong Station is only the 8th bus stop for limousine bus 6001 from Incheon Airport. Click here if you want to find out about bus 6015 from Incheon Airport to Myeongdong in Seoul city center. The next station name will be announced in four languages (Chinese, Japanese, English and Korea). Sound the bell to tell the driver that you will get down when you hear Myeongdong Station is the next stop. You can observe how other passengers do it before you reach Myeongdong station because it is the 8th station from Incheon Airport. Hope you will have a smooth journey from Incheon Airport to Myeongdong! Would you please advise whether this #6001 shuttle bus go to Dongdaemum Design Plaza DDP too? When its earliest bus schedule to Incheon Int'l Airport? Is it 4:30 am? Does it takes 100 minutes to the airport? Because my flight departs at 8:45 am on Monday. Hope to have enough time to get there and also claim my tax refund too. Many thanks and I really appreciate your help and info. Yes, this bus stops at Dongdaemun History Park Station (Dongdaemun Design Plaza). The earliest bus on weekday is 4.30am (It is departing from Dongdaemun Baiton Hotel then pass through a two stops to Dongdaemun History Park Station (Dongdaemun Design Plaza) bus stop. Since there is no traffic jam early in the morning, you should have sufficient time for your flight. Is the bus 6001 the KAL Limo Bus? No, bus 6001 is Airport Limousine bus, different from KAL Limo Bus. If you want to go from Incheon Airport to Myeongdong, Airport Limousine bus 6001 or 6015 from Incheon Airport is more convenient as they cover many hotels and places in Myeongdong. what is the earliest bus from myeongdong to inchuan airport on saturday? The first bus will depart about 4.30am to Incheon Airport on Saturday. Can I take the 6001 bus to T Mark Grand hotel? Yes, you can take bus 6001 from Incheon Airport to T Mark Grand Hotel by getting off the bus at Namdaemun Market bus stop. Hi, I'm staying at the Sejong Hotel. Should I take Bus 6001 or 6015? What is the name of the bus stop for Sejong Hotel? You can take either bus 6001 or 6015 as both bus stops at "Myeongdong Station" bus stop which is located very near to Sejong Hotel. If you find it hard to decide, I suggest you take bus 6015 and get off at "Myeongdong Station" bus stop. Sejong hotel is on you right (slightly uphill direction). Both bus stops at the same bus stop at Myeongdong Station bus stop for Loisir Hotel. I suggest you take bus 6015 which departs about every 15 minutes from Incheon Airport compared to 6001 which departs every 30 minutes. hai.. i will be stay at k-pop residence chungmuro. should i take bus 6001? where I had to stop nearest walk to the hotel? Yes, you can take bus 6001 and get off at Chungmuro Station bus stop to walk to k-pop residence Chungmuro. Hi. Can you please tell me the easiest way to go to Hotel Cozy Myeong dong? You can take bus 6015 from Incheon Airport and get off at the Namdaemun Market bus stop near to Hotel Cozy Myeongdong. Hi, I will be staying in L7 Myeongdong. Should I take #6001 or #6015? And which stop should I alight? You can take bus 6001 from Incheon Airport and get off at the Dongdaemun History and Culture Park Station bus stop and then walk for a few hundred meters towards Ojang-dong Junction to Baiton Hotel. Hi, May I know the earliest bus 6015 timing from T-mark hotel to Incheon Airport on Sunday as my flight is 9am? The first bus for bus 6015 to Incheon airport is at 4.25am. It should be early enough for your flight at 9am. Hi, how much is the #6001 limousine bus fare from Incheon International Airport to Sookmyung Women's University Station? And is it take roughly 60-70 minutes for the journey? I noticed the limo bus fare was much higher than AREX. Am I right? The bus fare for bus 6001 from Incheon International Airport to Sookmyung Women's University Station is 15,000Won. Yes, if you take AREX to Seoul Station and then transfer line Sookmyung Women's University Station, it will be around 9000Won. If you want cheaper option, take the all stop train (cheaper but slower) from Incheon Airport to Seoul Station and then transfer line to go to Sookmyung Women's University Station. The fare will be around 4250Won. Hi, appreciate your reply. Thank you! If you are taking bus 6001 from Incheon Airport, you can get off at Namdaemun Market(Hoehyeon Station) bus stop for new sun guest house. Have a wonderful trip! Hi, I will be staying in Acube hotel Dongdaemun, should i take bus 6001? how long will i walk to get to the hotel from the bus stop? thankyou! Yes, you can take bus 6001 from Incheon Airport and get off at "Toegyero 6, Sky Park Dongdaemun" bus stop. The walking distance from this bus stop to Acube hotel Dongdaemun is about 300 meters. Hi, will be staying at Tmark Hotel Myeongdong. From Incheon Airport on Limousine Bus, which station should I go down? Is it Chungmuro station Gate 4? And From Hotel to Incheon Airport, which station should i wait for Limousine Bus? bOTH BUS 6001 & 6015 IS OK IF AM STAYING AT TMARK HOTEL MYEONGDONG? Yes, you can take either bus 6001 or bus 6015 from Incheon Airport and get off at T Mark Hotel bus stop (also known as "Toegyero 3, Hanok Village" bus stop for bus 6001). For bus 6001, the bus stop for returning bus to Incheon Airport is opposite the road of the arriving bus stop. For bus 6015, the returning bus stop to Incheon Airport is the same as the arriving bus stop. Hi, May I know the earliest bus timing from k-guesthouse 1 myeongdong to Incheon Airport fastest bus on Thursday as my flight is 10am? And where the platform or depart area ? The first bus 6001 to Incheon Airport starts at 4.30am and there is no problem to get to Incheon Airport by 6am. I think you will have plenty of time to catch your flight. The bus will bring you to outside departure terminal of Incheon Airport. Hi! My family will be staying in Lotte City Hotel Myeongdong in Jung-Gu. Which bus number should we take? Appreciate your advise. Instead of taking bus 6001 to Myeongdong, you can take bus 6015 at Incheon Airport and alight at Royal Hotel (Euljiro 1-ga) bus stop near Lotte City Hotel Myeongdong. Instead of bus 6001, you can take bus 6015 from Incheon Airport and get off at Ibis Ambassador Myeongdong bus stop and walk to Lotte Hotel (5 minutes). Hi, Could you tell me where can we take the airport limo from k-guesthouse Myeongdong 2 to Incheon? What is the earliest airport bus leaving from Dongdaemun to Incheon Airport on 1 January 2017? Is it at 4.30am? Hi we will be staying at seoul family guesthouse, Which bus should I be taking and dropping off will be at? Thank you so much. and what time is the latest bus from the airport to myeongdong? we will arrive around 8pm can we still take the bus? can you tell me the easiest way to get to Seoul City Hotel located near Hoehyeon station exit 1 from Incheon Airport? our flight lands at 5:15am on monday Jan 9th 2016. You can take bus 6001 at Incheon Airport and get of at Namdaemun Market bus stop (Hoehyeon Station) to go to Seoul City Hotel. Alternatively, you can also take AREX train to Seoul Station and then change to Subway Line 4 to go Hoehyeon Station. Take EXIT 1 to the ground level to go to Seoul City Hote. My flight will arrive Seoul at 22:30pm on Jan 6. Is there still have bus to Myeongdong? You should have no problem taking bus 6001 from Myeongdong to Incheon Airport because the first bus start at 4.30am and take only 1 to 1.5 hour to get to Incheon Airport. You will not have problem to reach Incheon Airport by 6am. hi, i arriving seoul on the 12th jan, can i take bus 6001 to reach the k-pop hotel dongdaemum? Hi I will be staying in Days Hotel. Should i take bus 6001 or 6015? Either one will do because they stop at Myeongdong Station (different sides of the road). If you take bus 6015, just walk in the downhill (slightly) direction after get off the bus. If you take bus 6001, cross the road using traffic light zebra line and walk in the downhill (slightly) direction after cross. Hi! I will be staying in Days Hotel. I saw that the 6001 route says that the stop is Myeongdong/Sejong Hotel. Sejong in at the other end of Myeongdong. Will the bus really stop between exit 3 and exit 4 of Myeongdong station as stated above? hi, is the stop for route 6001 different if we want to go from city to Incheon airport? For Myeongdong Station, the bus stop for bus 6001 from the city to Incheon Airport is opposite of the arrival airport. I need to meet someone at the Bank of Korea after I fly into Incheon. Is the 6001 the better bus then - and where is the stop in relation to the BOK? Bus 6015 from Incheon Airport is better than bus 6001 because bus 6015 stops in front (opposite) of Bank of Korea at "Namdaemun Market" bus stop. Thought I responded but do not see it here - so thank you for this information. It must be right by Shinsegae Dept Store so we can hang out there til our son gets out of work:)Very helpful information! Hi, is bus 6001 stops at TMark Hotel? Yes, bus 6001 stops at TMark Hotel bus stop. Alternatively, bus 6015 also stops at TMark hotel bus stop. Hi, please advise which bus no should I take from Incheon Airport to Hotel Skypark Central Myeongdong, and which station should I alight? For hotel Skypark Central Myeongdong, you can take bus 6015 from Incheon Airport and get off at Royal Hotel (Euljiro 1-ga) bus stop. Hello, I will be staying at Nine Tree Premier Hotel Myeong-Dong II (72-10, Cho-dong, Jung-gu, Myeong-dong, Seoul, South Korea, 04555), which bus should I take, 6001 or 6015? And where do I alight? You can take bus 6015 from Incheon Airport and get off the bus at Royal Hotel (Euljiro 1-ga) bus stop, which is one stop after Ibis Myeongdong bus stop. This Nine Tree Premier Hotel Myeongdong is very new. Thanks for your reply. Can I know how far is the bus stop at Euljiro 1-ga to Nine Tree Premier Hotel Myeongdong II? How long do I have to walk? Personally, I would choose Nine Tree Hotel because of its near-ness to the bus stop for airport bus 6015 and 6001 as well as subway Myeongdong station and Myeongdong shopping area. There is triple room at this hotel too. Nine tree is full. Next option? 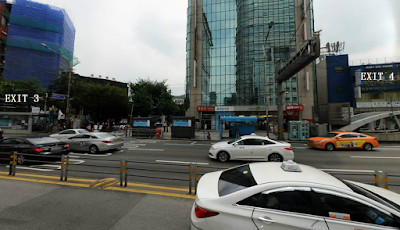 You may try Prince Hotel Myeongdong, Skypark Myeongdong III , Sejong Hotel Myeongdong or Loisir Hotel Myeongdong, all located near the Myeongdong subway station and bus stop for airport bus 6001 and bus 6015 from/to Incheon Airport. Hope you can find one that suit you. All the best! The first bus to Incheon Airport starts at about 4.10am for Bus 6015 and about 4.30am for Bus 6001 and you will arrive at Incheon Airport in about 1 hour 15 minutes. Hi, i will be reaching Incheon airport at 10Pm. Will i be able to board the bus? My hotel is located at myeongdong station. It depends on how fast you can clear immigration check and baggage collection (sometimes can take 1 hour if the airport is busy with many flight arrivals). But if you miss the last bus, you can still take AREX train to Seoul Station and then change to LINE 4 to take subway to Myeongdong Station. Hello hope you are doing well. I need to be arrived near Exit 3 of Myeongdong Station from Incheon Airport. Which bus 6001 and 6015 is the faster and closes to Exit E Myeongdong Station? Thanks tons! Bus 6001 Myeongdong Station bus stop is nearer to EXIT 3 of Myeongdong Station. If you take bus 6015 from Incheon Airport, it will stop near EXIT 8 at Myeongdong Station but you just need to cross the road using zebra cross traffic light to get to EXIT 3 on the opposite side of the road. Much appreciated for your info. Best wishes. Hi, I be staying at Hotel Skypark Myeongdong I. What Bus number should i take and where should i alight? You can take bus 6015 from Incheon Airport and alight at Myeongdong Station bus stop. If you take bus 6001 from Incheon you will also alight at Myeongdong Station bus stop but you need to cross the main road after alighting the bus to go to Hotel Skypark Myeongdong 1. I will be staying at the Tmark Grand Hotel Myeong-Dong which I think it is different from the Tmark Hotel Myeong-Dong. May I ask which stop (name and/or the number of stop) should I get off if I am taking #6001? 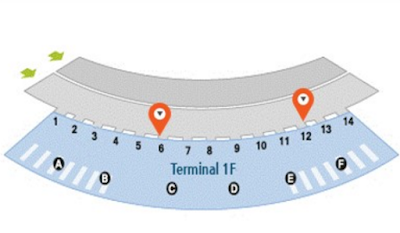 Is the return from hotel to airport on the opposite side? like to know if I take 6001 airport limousine, Does the bus stop at Namdaemun market earlier before Myeongdong Station ? Do I need to cross the road to find Tmark Grand Hotel or just in the bus stop side. Yes, you can get off at Namdaemun Market bus stop to go to TMark Grand Hotel if you take bus 6001 from Incheon Airport. Hello! I was wondering if I take bus 6001 to Myeong-Dong, will I be able to walk from Myeong-Dong Station to Lumina Hotel? Which is the place I am staying at. If you take bus 6001 from Incheon Airport, you should get off at Namdaemun Market bus stop to walk to Lumina Hotel which is nearby. Hi, which could you recommend as the best bus to get to the Somerset Palace? Thanks! You can take bus 6011 from Incheon Airport and get off at Auguk-dong Station bus stop. Then walk to Somerset Palace hotel. The walking distance is about 1km though. can I take 6001 to hotel skypark Kingstown dongdaemun? Hi, which bus will take me to Economy Hotel Myeongdong from Incheon Airport? Yes, bus 6001 can take you to Economy Hotel Myeongdong. Get off the bus at Myeongdong Station bus stop. Walk in downhill direction to the hotel. Hi, is this the same for Ekonomy Hotel Myeongdong Premier? Where should I get off? Hello,, I will be staying at IBC Hotel near Dongdaemun,, Can I still take this bus 6001 ? Please advice,, thank you ! Yes, you can take bus 6015 and get off at either Royal Hotel Euljiro 1-ga bus stop or BestWestern Gukdo Hotels (Euljiro 4-ga) bus stop. Either one, you have to walk a bit towards Euljiro 3-ga station direction as the hotel is located in between these two bus stop. Hope this helps. Have a pleasant trip. Can I pay cash to bus driver ? Hi, you can buy the ticket at the arrival hall at Incheon Airport. I am staying at seoul royal. it seems that it is better to take 6001 then. am I right? Do you mean Royal Hotel in Myeongdong? If so, it is better to take bus 6015 at Incheon Airport and get off at Royal Hotel (Euljiro 1-ga) bus stop. Hello, i love to read your info, it has help a lot of trvellers specially for those who can visit south korea for the first time like me.Can you please give me a complete direction on how to get from Incheon Airport to 57 Myeongdong Hostel. Thank you so much. More power and best wihes! You can take bus 6015 from Incheon Airport and get off at "Myeongdong Station" bus stop. After alight, walk in forward direction (slightly downhill) for about 200 meters until you reach Myeongdong 2-gil. 57 Myeongdong Hostel is on your right. Hello. I tried finding a map of 6001 route but could not find it. We are looking to stay at MyeongDong New Stay Inn (4-5F,14, Supyo-ro, Jung-Gu, 04554 Seoul, South Korea). Which stop should we drop at? Will the bus driver/ticket counter also let us know? If you are staying at Myeongdong New Stay Inn, it is nearer to take bus 6015 at Incheon Airport and then get off at "TMark Hotel Myeongdong" bus stop. Walk in forward direction to for about 40 meters and turn right into Supyo-ro to walk for another 100 meters or so to reach Myeongdong New Stay Inn. *For local day tours and ticket booking in Seoul, we recommend Klook Travel https://goo.gl/GRKbyB . Enjoy your stay in Seoul. Hey, thanks! The hotel has also advised me to take bus 6001 instead and drop off at Togyero 3-ga Hanok Village Korean House station. They provided us walking directions as well. Does this work or your route is more advisable? Thank you for highlighting this. The fare for bus 6001 and bus 6015 are now both KRW15,000 officially (same price). Hello, I'll be staying at Nine Tree Premier Hotel Myeondong 2. Please advise which bus should I take & which station do I alight. Please also advise how do I walk from the station to hotel & how long is the walk. As I'll be arriving at 10.15pm, what is the alternative transport if I missed the bus? How much would it cost to take a taxi from the airport to the hotel? For Nine Tree Premier Hotel Myeondong 2, you can take bus 6015 from Incheon Airport and get off at Pine Avenue, Euljiro-2ga bus stop to walk to the hotel. Thanks yr advise will be really useful for my trip. Yes, both bus 6001 and bus 6015 operates on Sunday too from Myeongdong to Incheon. Good morning, we intend to take the 6015 bus to Incheon airport tomorrow (Saturday). Do we pay the driver the bus fare in cash or with T money please? Thank you. Yes, you can pay bus fare when boarding the bus using cash or T Money card. Have a safe journey. Hi, I am Joanne. I will be staying at Courtyard Marriott Seoul Namdaemun so should I take 6001 or 6015? Which stop should I get off at and what is the direction to the hotel? You can take bus 6015 from Incheon Airport and get off at Namdaemun Market Station. After getting off the bus, just walk in backward direction for about 200-300 meters until you see Couryard Marriott Seoul Namdaemun hotel on your right hand side. It is located before the big Namdaemun junction. If you need local tours / tickets during your stay in Seoul, you can pre-book online for more saving https://goo.gl/GRKbyB . Enjoy your trip! Thanks so much, Chicken Share. I came across a map which shows route 6005 also stops nearby (near Fraser Place Namdaemun Seoul). Is that closer to the hotel? Since I am traveling with a young child, I want to find the closest stop. Yes, you can also take Bus 6005 from Incheon and get off at Fraser Place Namdaemun bus stop. The walking distance is indeed shorter (about 100+ meters). hi, i have read about your post stating that we need to cross opposite myeongdong station to take the shuttle bus to the airport. 1) where is exactly the location? 2) cant i board the bus to the airport from the location where i have alighted? The location of the bus stop to Incheon Airport is located across the road from the arriving bus stop (cross the road at the traffic light zebra cross in front of Prince Hotel located after EXIT 2 to get to the bus stop for Incheon Airport). You can also board the bus from the location where you have alighted but the bus will take to make a round before coming back to the bus stop across the road. Hello! I will be staying at Hotel PJ and I would like to ask if I will be able to board the bus (6001/6015) back to Incheon Airport from Chungmuro Station stop? If yes, how long would the journey take as well? Yes, if you take bus 6015 back to Incheon Airport, then you can board the bus from the same bus stop at Chungmuro Station you arrive. If you take bus 6001, then the bus stop to Incheon Airport is opposite the road of arrival bus stop. Hi I will be staying at Staz Hotel Myeongdong ll. Should I take bus 6001 or 6015? You can take either 6001 or 6015 (6015 more frequent). The station to get off is TMark Hotel Myeongdong bus stop. Hi there, we will be leaving from Tmark hotel for a 16:15 pm flights on a Friday. What time should we take the bus 6001 to Incheon Airport? I am worried about the traffic. Please advise. Thanks so much! You can leave around noon time if you want to have ample of time at the airport. There are much to do and see and Incheon Airport too. You can also take bus 6015 if it come first. Could you please show me how to take bus to Gwangjang market from Incheon? Could you please show me how to take bus to Gwangjang market from Incheon Airport? Hi! Could you please share where I should get off from the 6001 bus if my hotel is in Morning Sky Hotel (32-327 Togye-ro 45-gil,Jung-gu, Myeong-dong)? Thank you so much! 17F, 55, Myeongdong-gil, Jung-gu, Jung-Gu, Seoul, 100-021, Korea, South . You can get off bus 6001 at Myeongdong Station bus stop and then walk into Myeongdong 10-gil for about 250 meters to get to Philstay Myeongdong. WE will be staying at T Mark Hotel Myeongdong. What airport bus should we take and where do we alight? Thanks so much for the assistance. You can get off at Toegyero 3, Hanok Village T Mark Hotel bus stop. This bus stop is one stop after Myeongdong Station bus stop for bus 6001. Hi. We are staying at rainbow hostel myeongdong. What bus should we take from incheon airport? And is the hostel near the bus stop? Thank you. Hi, I will be staying at Lumia Hotel in Namdaemun. I have need to take the 6001 bus to reach Incheon Airport at 8:30am. How long does the 6001 take from Namdaemun Market ? Can I know which bus to take? 6001 or 6015? And alight at which part of Myeongdong station? Hi Chicken Share, I have been reading all your replies and their are really helpful. But I got confused at some point, would appreciate it if you could help me clear some doubts. I will be staying at Tmark Grand Hotel Myeongdong. If I am intending to take the bus 6001, which stop should I be alighting at? In the previous replies you mentioned either Namdaemun MArket Bus Stop or Toegyero 3, Hanok Village T Mark Hotel bus stop to get off at. So which busstop should I be getting of at then? i'm planning to stay at Dongdaemun, Euljiro CO-OP Residence. Yes, you can catch the bus to Incheon Airport from the same bus stop as the arrival bus stop at Euljiro Co-op residence. Hi, I'm heading to Dragon Hill Spa, their website suggested to take this bus, however I'm not so sure which stop should I get off. I'm going to stay at Pacific Hotel, which is more convenient between bus 6001 and 6015? TIA! I'm stay in L7 hotel and understand take 6001, just to confirm we get down the bus is it last stop? If going back to the Incheon Airport, we can get in the place we stop or need to across the road? In Airport we can buy the tickets in counter for bus 6001 to Myeongdong, how about going back to Airport ? using T-Money or pay driver ? or have counter there to buy the ticket before get up to the bus ? Do we need to book the ticket in advance or can directly board the bus pay to the driver? If you take bus 6001 from Incheon Airport, you can get off at Toegyero 3, Hanok Village(TMark Hotel) bus stop. I do not know the exact address of your airbnb but the area's nearest bus stop will be either 1.) Myeongdong Station bus stop or 2.) Toegyero 3, Hanok Village(T Mark Hotel) bus stop and then walk there. Maybe you should ask your airbnb host for further information. I will be staying in PJ hotel and I’m wondering whether after I alight at chungmuro, do I take a shuttle bus to pj? Or do I walk there? So taking 6001 is correct? just wannak ask, how to make a reservation a bus from incheon airport to seoul?. because i didint cant find the website of it.im going to seoul on january 2018. please let me know asap. thanks in advanced. Hello, If you are staying at L7 Myeongdong Hotel, 6015 may be better because you do not need to cross the main road after alight from the bus (you need to cross the main road if you take 6001). The station to alight is Myeongdong Station bus stop. Hi, I would like to know coming from Incheon Intl Airport to Myeongdong, the bus will stop near exit 3 and 4. How about from Myeongdong to Incheon Intl Airport, where can I see the bus stop? The bus stop to take bus 6001 from Myeongdong to Incheon Intl Airport near EXIT 8, opposite the arriving bus stop. At this bus stop, you can also take 6015 to Incheon International Airport. Hi Chicken Share. On May 2018, I will come to Seoul and stay at the guest house in Myeongdong. If I take the Bus 6001 & I mention to the bus driver that I want to stop at Myeongdong also can right? Yes, you can take bus 6001. You do not need to mention to the bus driver because the next bus stop name will be announced on the bus in Korean Language, English, Japanese and Mandarin. Just press the bell button to get off at the next bus stop. Hi, I will be staying at Hotel New Oriental Myeongdong, which bus is better, 6001 or 6015? Thanks in advance. Hi. We will be staying at 57 Myeongdong Hostel and will arrive at Incheon International Airport at around 11pm, via Terminal 1. What should we take to bring us to the hostel? Thanks for your reply. Hi we’ll be staying at TOP HOTEL myeongdong near exit 1 of HOEHYEON station. If we’ll be taking bus 6001 from the airport, can we get off at tmark bus stop and walk? I just noticed that if we get off at namdaemun bus stop it will take a while since the bus will still go around myeongdong and dongdaemun area. Please correct me if im wrong. Thanks! Hi, I will be staying at the Tmark Grand Hotel Myeongdong. I understand a bus from the airport stops right in front of the hotel. Which bus should I get on and which station should I get off in order to be in front of the hotel? Thanks! For Tmark Grand Hotel Myeongdong, you can take bus 6001 from Incheon Airport and get off at Namdaemun Market(Hoehyeon Station) bus stop. Station name will be announced on bus before arrival. Hello, i want to know what is the latest bus at night ? because my arrival will be at 10.30 pm . And will there any taxi that i can take if there are no bus anymore? Where can I buy a ticket from Myeongdong to the Incheon Airport? I'm planning to stay at Creto hotel which bus should I take and where do I get off? Thank you! Hi, I will be staying at the Gloryinn , I know the bus 6001 from the airport stops opposite the hotel, can you tell me which station should I get off in order to get there. Also, when I return to the airport, should I go to the same stop to get the bus 6001 back to the airport. Thank you. I am staying at the Grand Hotel Myeongdong, can I take bus 6701 instead of 6001? Hi. My family will be staying at K Guesthouse Myeongdong 2 , what bus 6001 or 6015? We want to avoid crossing the road. Thank you. I know it's out of topic, because when I tried to click to express train (Arex) menu, it's connected to other website. So please allow me to ask in this thread. My question is, if we use express train to Myeongdong, is Seoul station still the last stop of Arex and we must change to other train? or just wait at the same train?